The eastern Pacific is a hot bed of storm activity right now and that's mainly because the ocean is very warm over there. 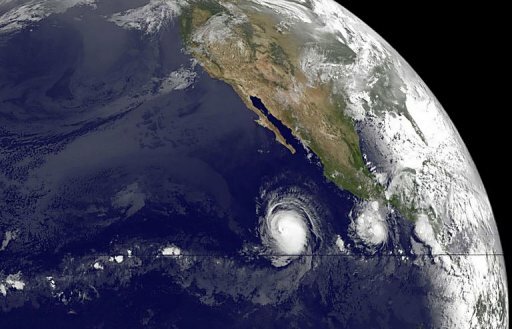 A pair of cyclones are now spinning off the coast of Mexico, Hurricane Celia and Tropical Storm Darby. Hawaii News Now. The National Weather Service has extended a red flag warning for Leeward areas of the Hawaiian Islands.KHON2.. The Hawaii Business Roundtable clarified yesterday that it has not taken a position on a civil unions bill, responding to internal dissent and under pressure from gay rights advocates for urging Gov. Linda Lingle to veto the measure. Star-Advertiser. Why the Roundtable Quieted Its Civil Unions Storm. Civil Beat. The state won't be able to delay future tax refunds quite as long as it did this year, under a bill signed into law on Wednesday. KHON2. More serious questions came out Wednesday about the state Tax Department’s contract with a Canadian technology company called CGI. KITV. The Hawaii County Planning Department won a court victory Tuesday that could set a statewide precedent for other counties that miss self-imposed deadlines. West Hawaii Today. Nearly eight years after taking office, Gov. Linda Lingle is still excited about Hawaii's renewable energy projects. West Hawaii Today. Charles Djou raised $1.4 million in his special-election victory for Congress in May and had more cash in the closing weeks of the campaign to outspend state Senate President Colleen Hanabusa and former U.S. Rep. Ed Case, his main Democratic opponents. Star-Advertiser. A recent fundraising trip to Pittsburgh is again causing heartburn for the Democratic guber- natorial campaign of Mayor Mufi Hannemann. Star-Advertiser. Former Congressman Neil Abercrombie's campaign for governor will pay a $50 fine for filing notice for an April fundraiser in Washington, D.C., several hours late. Star-Advertiser. A proposed project to control the spread of strawberry guava is expected to receive a finding of no significant impact, according to a draft environmental assessment released today by state officials. West Hawaii Today. Residents have until July 23 to comment on an Environmental Assessment concerning the release of a natural predator to control strawberry guava in Hawai‘i, according to a state Department of Land and Natural Resources news release. Garden Island. After reviewing petitions to list seven species of Hawaiian yellow-faced bees as endangered under the Endangered Species Act, the U.S. Fish and Wildlife Service has determined that the documents present substantial scientific or commercial information indicating that listing may be warranted, and will initiate a 12-month review of the species' status. Big Island Weekly. Tired of the loss and damage over the years, residents on Oahu's north shore learned about some potential solutions from a special meeting in Haleiwa on Wednesday night. Hawaii News Now. Now that Hawaii County has the authority to pass laws restricting or even banning the use of fireworks, officials are being careful on what steps they will take next. Hawaii Tribune-Herald. The Maui Planning Commission got the first public look Tuesday at detailed designs for the long-debated - and for many - long-awaited Honua'ula 1,400-unit housing development in South Maui. Maui News. North Hawaii residents soon will have an easier time registering motor vehicles, and area crime victims will receive more privacy when talking with prosecutors. HHawaii Tribune-Herald. The Ane Keohokalole Highway took another step forward Tuesday, when a Hawaii County Council committee approved the donation of nine lots and 16 easements from adjoining landowners. West Hawaii Today. An early-afternoon brush fire caused massive traffic tie-ups Tuesday in Kahului after police closed a section of Hana Highway because of poor visibility caused by smoke and dust. Maui News. The Heart Center at Hilo Medical Center is currently operating without its full-time cardiologist. Hawaii Tribune-Herald. With an adult day care center opening at Home Pumehana in August, caretakers on Molokai can breathe a sigh of relief. Molokai Dispatch. Our story last week about the changes in Hawaii’s journalistic landscape–and a note here about how those changes affect readers of the Weekly–brought in a strong response from readers. Honolulu Weekly. Public safety will not be jeopardized, and the public will be inconvenienced minimally under the Honolulu Police Department's furlough plan set to begin next week, Police Chief Louis Kealoha said yesterday. Star-Advertiser. Kauai County officials recently announced a two-day per month furlough plan that will be effective July 1, 2010 to June 30, 2011. Garden Island.